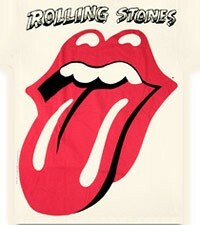 So, I was perusing the Internet the other day and came across THIS PAGE about the creation of the Rolling Stones logo. Everyone knows the iconic logo as the tongue! Where I am going with this? Well, as I read on, I discovered that the logo, created in 1970, wasn't just designed after Mick Jagger's notorious mouth, it was inspired by the Hindu Goddess, Kali. In Hindu, Kali means "the black one" or "lord of death", as stated by Wikipedia, though in Indonesia, Kali means "river". According to story, Kali went on a killing spree in a battle with evil, destroying everything in sight. In order to stop her, another God, Lord Shiva, threw himself at her feet and Kali then, stuck her tongue out in astonishment...hence, the depiction of the tongue in most of her illustrations. And since we are on the topic of Mick Jagger and Bali...did you know he married in Bali to American model Jerry Hall, in 1990? They had a Hindu ceremony in Ubud. Ahh, gotta love both Mick and Bali!